To get a better idea of just what is going on with the current volcanic eruption of Kilauea on the island of Hawaii, take a look at a topographic map of the island. Richard Fiske, geologist emeritus at the Smithsonian’s National Museum of Natural History, says topography—charting the land’s surface shapes and features—reveals this island contains a huge ridge that extends about 50 miles east of the summit of Kilauea to the island’s eastern tip and then for many more miles underwater. This ridge was built by thousands of eruptions, the same type that have happened at Kilauea this spring. 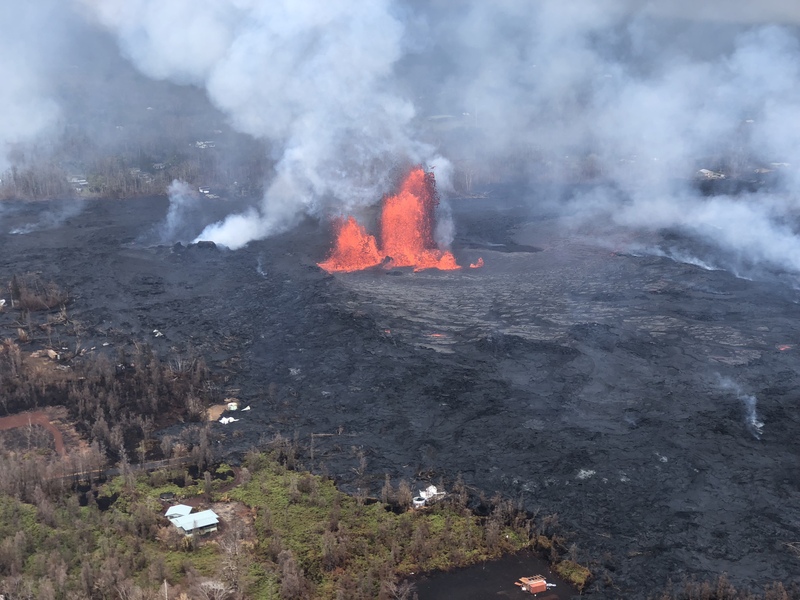 “Eruptions take place repeatedly along and near the crest of this ridge—both on land and along the submarine extension of the ridge and have done so for thousands of years,” Fiske says. Kilauea’s summit area receives about 70 inches of rain each year and much of it percolates underground to form an extensive water table. When the lava level in Kilauea’s crater lowers, water from the surrounding water table can seep into the crater, triggering violent steam explosions. These explosions can throw rocks, some more than a foot in diameter, far out of the crater. “When this occurs, it can be quite dangerous to be within a mile or so of the crater,” Fiske says. 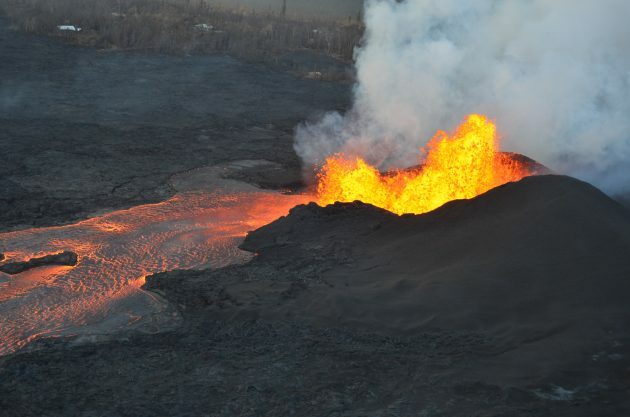 Hawaiian volcanoes such as Kilauea are different in many ways from volcanoes in other parts of the world, mainly because the source of their magma originates from a “hot spot” deep beneath Hawaii’s crust. This hot spot releases magma that rises through the region’s tectonic plate—somewhat similar to a welding torch burning a hole through a piece of steel. 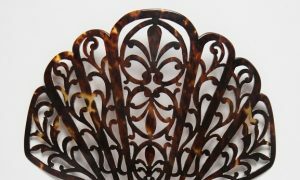 The origin of the hot spot is unknown. At about 2,100 degrees Fahrenheit, lava flowing from Kilauea and other Hawaiian volcanoes is about 700 degrees hotter than lava flowing from other volcanoes in the world. A relative paucity of silica makes Hawaiian lava more fluid and less likely to clog volcanic vents. Hawaii’s low-silica magma produces volcanoes with low-domed gently sloping sides, called shield volcanoes. 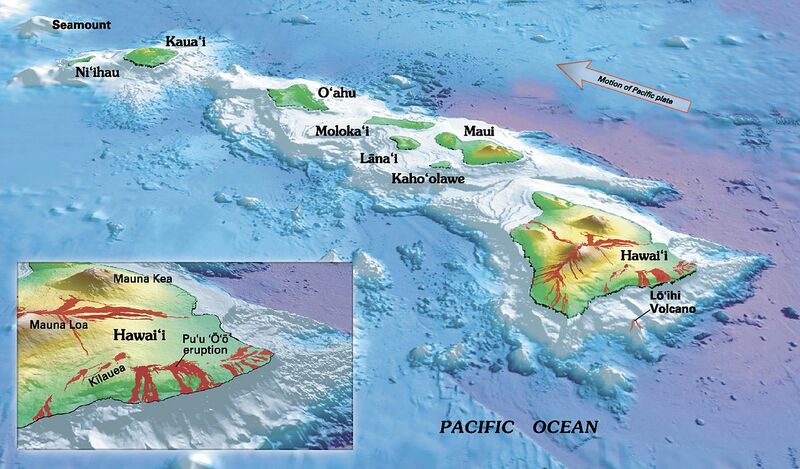 The motion of the Pacific Plate carries the Hawaiian Islands northwestward at the rate of about 2.7 inches a year. Over hundreds of thousands of years, plate motion carries active volcanoes away from the hot spot making them less active and eventually causing them to become extinct. Magma travels from Kilauea’s summit along the ridge from the volcano’s crater, on the surface and underground. 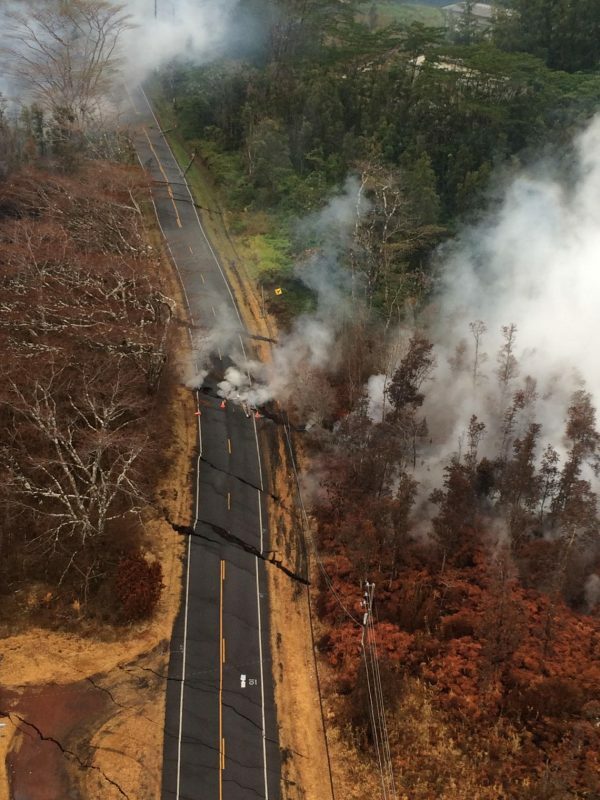 The sudden appearance of erupting fissures near Kilauea this spring has destroyed houses and properties along the volcano’s east rift zone. Looking at the situation in a broader perspective, the huge East Rift Zone ridge, and the thousands of ancient lava flows it contains is evidence that future eruptions will continue to occur. Get answers to your volcano questions and explore a database of 10,000 years of eruptions on the Smithsonian’s Global Volcanism Program website.